Great leaders use Power Language to add interest and colour to what they say. There are ten core techniques that great leaders use to make their talks and presentations more powerful. These are the ones we share with our clients to help them create stand-out talks and presentations. Some of these techniques can be used to structure your talk or presentation, while others should be used sparingly. Like seasoning in a meal, they should add subtle flavour without being overly pungent. Describe an unsolved puzzle or problem. You could do this in your introduction, or at the start of a new section of your talk or presentation. It creates tension in the minds of your audience, which they will want to resolve. If the puzzle or problem is sufficiently compelling, your audience will be switched on, waiting to hear your potential solution. On hearing this, we feel overwhelmed by the scale of the problem, and wait to hear what Sheryl will suggest can be done about it. Alliteration is when a sequence of words share the same starting letter or sound. This gives a poetic flow to your spoken language, and makes key messages more memorable. Speeches, slogans and soundbites are full of phrases comprising three parts. As children we read about the Three Little Pigs, in our teens we watch trilogies and as adults we encounter triads constantly – in marketing (‘reuse, reduce, recycle’), in mottos (‘location, location, location’) and in politics (‘Life, liberty, and the pursuit of happiness’). Listing three items provides for sufficient substance while still being easy for an audience to process and remember. Any more, and we struggle to hold all the concepts in our head at once. Rhetorical questions prompt your audience to think about your topic. They can also lead people to arrive at a conclusion by themselves. This is much more persuasive than telling your audience what to think. Researchers found that the impact of rhetorical questions varied, depending on the strength of the speaker’s argument and the personal relevance of the topic to the audience. For strong arguments on topics of low personal relevance, rhetorical questions enhanced persuasiveness. This was also true for weak arguments on topics with a high personal relevance. Other research found that rhetorical questions makes the speaker appear more polite and likeable (Bates, 1976) and that the mere presence of rhetorical questions signals a strong argument (Zillmann, 1972). Occasional use of rhyme can add rhythm to your talks and presentations and make your message more memorable. One study also showed that people are more likely to believe something is true if it rhymes. Jack Welch’s ‘Rank and yank’ policy of firing the bottom 10% of his company. Richard Branson’s, ‘Screw it, let’s do it’ approach to new projects. David Cameron’s ‘This isn’t job done; it is job begun’ at his 2014 party conference speech. You could imply a stronger link between two concepts, by using similar-sounding words to refer to them, e.g. ‘Your attitude determines your altitude’. Or you could use internal rhyme (not at the end of sentences) for a more subtle use of rhyme that makes a sentence sound more delightful to the ear. Like alliteration, rhyme is another technique to use sparingly. If more than two sentences rhyme, your audience may perceive that part of your talk or presentation as childish or contrived. You can use repetition in both your words and your messages. Familiarity breeds trust when it comes to repeated messages. Present your message to the audience early on, so those ideas start to feel familiar when you restate them in slightly different ways later. Comedians use this technique all the time. They tell a joke at the start, then refer back to it and build on it throughout their show. It’s a great way to bring the audience with you and make it easy for them to follow what you’re trying to say. In 2010, Steve Jobs held an emergency press conference about the antenna in the iPhone 4. He repeated the phrase “We want to make all our users happy” several times. His slides used variants of the message ‘we love our users’, words which Jobs echoed in his conclusion. This ‘love’ was picked up and reported on by the media covering the event. The persuasive impact of repetition is even stronger when you prompt your audience to retrieve your message from their memory. For example, you could refer to something you said earlier, but restate just enough of it for people to identify and recall the rest for themselves. Or you could show a heading or an image from a previous slide to prompt a visual flashback. 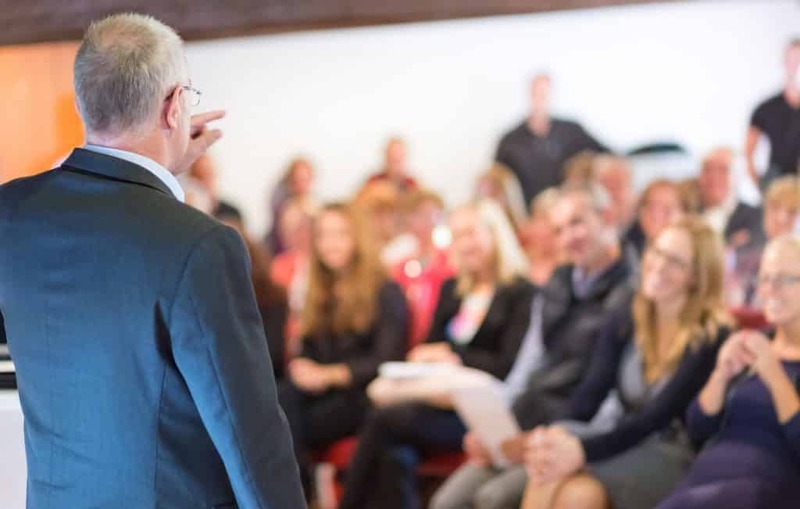 To be effective at public speaking you need to hold an audience’s attention. Creating tension is a great way to do this, as with setting out a puzzle or problem in technique #1. Contrasting pairs create tension between two opposites. You could ask ‘Are you with us or not?’ but it’s much more powerful to say, ‘You’re either with us, or against us’. Contrasting pairs can also clarify your position by stating clearly what you are arguing against, as well as what you are arguing for. This technique can be used on a macro scale as well. In Nancy Duarte’s TED talk (at 6.45mins), she shows how many of the greatest speakers contrast ‘what is’ with ‘what could be’. This is repeated over and again, providing a subtle underlying structure to their talks and presentations. Comparing something to a different thing can help your audience to understand and visualise it. This is especially true if you are explaining something abstract or unfamiliar, or want to express a thought or feeling powerfully. Metaphors, similes and analogies are all ways to achieve this. Even a subtle metaphor can have a substantial impact on how a person perceives an issue and makes a decision, according to researchers. Steve Jobs used a metaphor when he referred to Apple’s switch to different processors at the MacWorld keynote speech in 2007 (0:01:03). He called it ‘a huge heart transplant to Intel microprocessors’. Spoken language is most easily digested when delivered in bitesized chunks. Yet our businesses, strategies and communications all tend to be complex. So when you come to deliver a talk or presentation, it’s all too easy to confuse your audience. Simplify as much as you can. As Albert Einstein said, “Everything should be made as simple as possible, but not simpler”. Separate out long sentences into shorter ones, and avoid sub-clauses or complex sentence constructions. Use short, common words instead of longer ones. Although people tend to think that the use of jargon or unusual words will impress others, the reverse was found to be true. In fact, the easier your talk or presentation is to process, the more your audience will infer you as having qualities such as confidence, intelligence and capability. That’s according to research by Daniel M. Oppenheimer, professor of psychology at the UCLA Anderson School of Management. Great speakers involve their audience in their talks and presentations by making it personal. For example, you may recognise these: ‘We are gathered here today…’, ‘Ask not what you can do for your country…’ and ‘I have a dream’. Researchers found that using personal pronouns motivates people to learn, and makes that learning more enjoyable. There could be a financial value, too: in another study, researchers found that using personal pronouns in a phone call increased the chance that a prospective investor would agree to invest. So instead of talking about ‘the company’s’ targets next quarter, talk about what ‘we’ want to achieve. Instead of talking about what a new widget does for ‘people’, talk about what it will change in ‘your’ life or ‘our’ lives. Take ownership for your thoughts, opinions and stories by starting them with the word ‘I’. Power Language techniques are like butterflies in a garden, adding life and colour to your message. They draw your audience back from their thoughts and into the present moment. Using powerful language in your talks and presentations is just one element of mastering public speaking. At Benjamin Ball Associates, we help leaders to look, sound and act impressive. CEOs and Senior Executives consistently rate our award-winning training as the best they’ve ever had. Find out how we can transform both the content and delivery of your talks and presentations to make you stand out. Call Louise Angus on 020 7018 0922, email her via louise@nullbenjaminball.com or fill in our enquiry form.